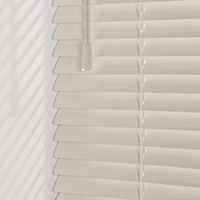 Our House Venetian blinds are stylish and practical and suitable for all rooms including areas of high moisture such as kitchens or bathrooms. A wide range of colours is available, each with a 25mm slat width. For exact colour matching please request a free sample. Our Luxury Venetian blinds offer a fantastic array of colours and finishes, including matt, gloss, metallic & wood-effect. All colours are available in 25mm slat width with selected colours also available with 35mm or 50mm slats - availability is indicated under each colour. For exact colour matching please request a free sample.